WHY GREENSTALK? • The only stackable system that waters all levels equally using only gravity • Top water reservoir shows you how much to water • Slow drip system is beneficial for plants • Waters roots, not leaves • Waters all pockets/plants at the same time • Limited soil exposed to minimize water evaporation • When used correctly, no water waste • Takes up little space - fits on patios, in greenhouses, gardens, and screened-in-porches • Grow up to 90 plants (5 tier) in 2 square feet • Stacks down for quick storage • Portable - can unstack (even while planted) to transfer to a different location • Grows vegetables, strawberries, herbs, flowers (even root vegetables) • No weeding or tilling • Minimizes pest problems • Adds height and color to your garden or deck • No bottom tray so it doesn't attract mosquitos or over-saturate bottom planter • Low maintenance design makes it possible for anyone to have a garden (limited mobility, elderly, and children) • Lighter and more durable than other plastic, ceramic, or clay planters/pots • Easy to assemble • Comes in several different colors - something for everyone • Made in East TN • Family-run business • 5 year manufacturer's warranty - on utility & color • Great teaching tool - shows kids where food comes from • Move indoors to grow year-round • No electricity, pumps, or special solutions needed • Saves money on groceries/fresh produce Lookup "GreenStalk" online for more reviews and ideas of what you can grow! *The entire 5 tier system assembled is 54.25" tall with a footprint of 19". It comes with 10 easy-to-assemble pieces (5 planters; 4 watering disks; 1 water reservoir). Comes with a 5 year warranty against cracking/fading even if left outside year-round. 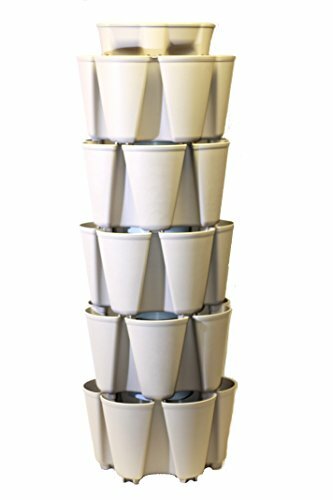 To water the entire system use GreenStalk's patented watering system: simply fill to the 5 tier mark on the top water reservoir to water all the tiers below. GreenStalk is the ONLY system that waters all tiers at the same time. Other stackable gardens over-saturate the top tiers to get to the ones on the bottom. If you have any questions about this product by Greenstalk, contact us by completing and submitting the form below. If you are looking for a specif part number, please include it with your message.